U.S. Agriculture Secretary Sonny Perdue (center) chaired a task force of Trump cabinet members looking into how to improve the rural economy. As of 2014, 61 percent of rural residents had access to high-speed Internet compared to 96 percent of urban people, according the task force report. The federal government defines broadband by a download speed of at least 25 mbs. “We envision a rural America with world-class resources, tools and support to build a robust sustainable community for generations to come,” Perdue told the American Farm Bureau Federation conference in Nashville, Tennessee. Just hours after the report was released, President Donald Trump spoke to the conference and signed two executive orders: one to streamline approval of broadband projects and the other allowing towers to be built on federal land. The task force also calls for more research on where broadband gaps remain and what it would cost to bring those areas up to speed. Chambers says the development of rural broadband has been hampered in part because federal funding still pays for slower networks in rural areas. Chambers adds that the FCC could broaden the range of businesses that are eligible for broadband funding to possibly include electric companies, cable providers and tech firms. “If Google believes in balloons and Facebook believes in drones and OneWeb believes in satellites and every other type of technology, let them all compete,” Chambers said. Besides broadband, the rural task force suggests boosting rural economies by improving services to veterans, expanding trade and rebuilding infrastructure like roads, bridges and small-town water systems. 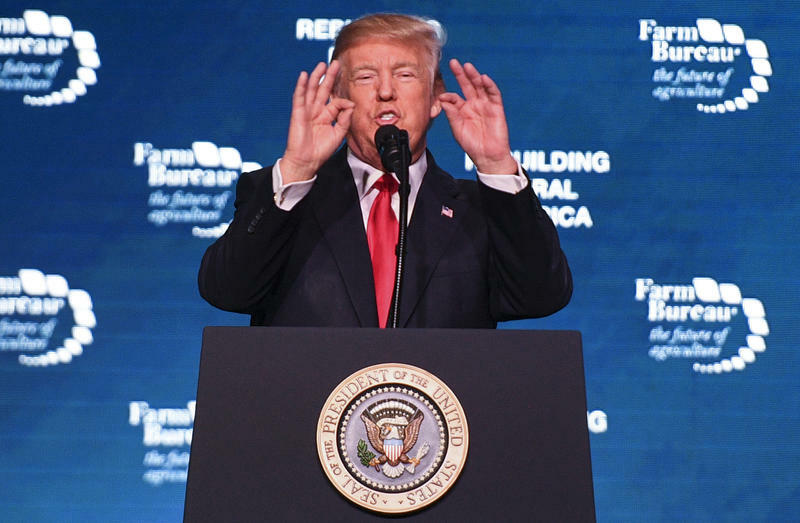 President Trump thanked America's farmers for their political support on Monday and unveiled a plan designed to help revive fortunes in struggling rural areas. At the same time, the president is pursuing trade and immigration policies that could be harmful to farmers' bottom lines. Farmers from Alabama and Nebraska and the Organization for Competitive Markets, a nonprofit that works on competition issues in agriculture, filed the suit Thursday in the 8th U.S. Circuit Court of Appeals. Peyton Manning, the NFL quarterback-turned-pitchman, apparently has another side hustle: Certifying shipments of grain as organic for a Nebraska-based agency called OneCert. Problem is, OneCert president Sam Welsch doesn’t remember hiring Manning for his business, which is accredited by the U.S. Department of Agriculture to inspect everything from small vegetable farms to processing plants and international grain operations. On a feedlot in far southwest Kansas, two cowboys on horseback move cattle on the high dusty plains, spread out like dozens of football fields stitched together with miles of fences. Their “Buenos dias! Buenos dias!” greetings mix with moos on a hot summer morning. They’re two of the 400 employees who work on the feedlot, which is one of the largest in the U.S. in a state that ranks third in meat production. In places where the unemployment rate is well below the national average — states like Nebraska, Colorado and Iowa — one would think it’d be easier for communities to recruit new residents to fill open jobs. But the housing market works against rural towns and cities where jobs often stay open because there are too few affordable homes and apartments to buy or rent, or the ones that are affordable need lots of TLC. It’s a situation that threatens to turn low unemployment from an advantage into a liability.